We’re doing our multi-media spectacle, Promethean Waltz, again! 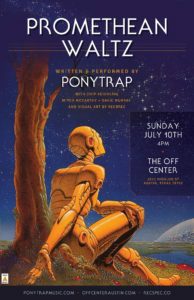 Come to the Off Center on Sunday, July 10 for some noise, some robots, and some fantasmic visual art by RecSpec. Featuring narration by Chip Keichline, additional percussion by Davie Murray and Mitch McCarthy, and the music of Ponytrap.